With the impending new addition (and cold weather) he was itching to get one last backpack trip in for the two of us and my upcoming trip to California for work offered just that opportunity. We two two days off and headed out into the Yosemite backcountry for a few days of R&R (and with how work’s been lately, it was totally needed!). The plan was for a 9 mile first day, 5 – 7 miles second day and a 7 mile hike out the third day. Things happened a little differently than planned but overall was a resounding success. Ireland lake! We looked quickly for a spot to bed down and once it was found I set up the tent and we promptly crashed and were out for the night (skipping all the sunset pics and starry night pics DH loves to take – we were just too tired). The bean let me know he/she was there as I was curling up to sleep by thumping me a few times from inside her comfy home. The next morning we took our time getting up and moving. We broke camp around 10:00 and started our cross country trek up and over the saddle on to our next spot. It was to be a rather short day – 5 to 6 miles maybe and proved to be the best day on the whole trip (and even shorter than we thought!). We took our time climbing up to the saddle between the two basins and rested at the top for an hour or so just soaking in the sights and the silence. DH decided to climb the peak next to us while I relaxed and read my book! Once we were done there we made our way down the opposite side, took in a few lakes on our way and finally made it to our night spot at Fletcher lake. The pic below is me and my belly at Townsley lake. Such a picturesque setting. Not much camping to be had here but it was a nice stop on the way. Day two ended up being 4 miles at the longest (we wandered for awhile before dropping the tent so I’m not positive of how far we went). We were definitley tired – cross country travel is harder than trail travel so we made camp early, relaxed, and then took in an amazing sunset over Fletcher peak. The last treat of the night was sitting on a rock that was still warm from the days sun and watching the stars come out. From there we crawled in for the night and were out. Bean gave me a quick tap too to let me know he was happy we’d finally stopped moving. Day three greeted us with the sun lighting up the tent at about 6:30am. DH wanted badly to get some sunrise pics so I woke him up and shuffled him out of the tent with the camera and tripod. I promptly stole his thermarest and made myself a very cushy bed to catch a few last z’s on. I woke an hour later and he’s still no where to be found and the sun’s completely up. I figure he’s just on his way back and start to break camp, pack things up and make breakfast. He finally rolls in around 8:30 and has some amazing shots (I’ll get those posted to our photo blog in the next week or so). We eat, finish packing, and start our trek out. It’s mostly down hill but is still about 7 miles total. One quick stop for lunch and a dip in the river to numb our sore limbs and we were back at the car and alive! Baby went on it’s first backpack trip while still in mommy’s tummy. I can’t wait to tell him or her that when they get older. Overall I think I did better on this trip than have have on non pregnant backpack trips. One, I was more conscious of my water and food intake and we took lots of time to rest and relax. Two, my pack was slightly lighter than normal. Three, I knew this was our last big backpack trip for quite a while so normal aches/pains/complaints held little weight in my brain and were quickly dismissed/suppressed and put aside so we could just enjoy the experience. Once bean is born we’ll have to wait until he/she can walk on their own to backpack again. For now we’ll have to stick with car camping or trips without one another so someone can watch the little one and that’s okay! I can’t wait to introduce our children to the wonders of backpacking and the outdoors. DH already had 4 or 5 trips planned to National Parks once they’re old enough to understand and appreciate. I have about 4 back blog posts that I need to finish and post but have been on vacation and am now in California for work (which leaves no play time at all:( ). I promise to try to finish some of those tonight and get them out. I’m also picture-less this post because I’m in Cali with no camera. I do have a fun post coming up once DH gets home and offloads some pics from this weekend – then you’ll have babybump galore! How far along are you? 18 weeks! Food Aversions? Nothing – it’s starting to be a problem! Belly button in or out? Getting shallower most definitley. Milestones? The Linea negra is starting to appear! And congrats to my friend Yvonne who delivered little Emilyn over the weekend – 4 weeks early! 5lb 12 oz and doing just fine – she’s quite the little peanut! How far along are you? 17 weeks! Maternity clothes? Yup! and I need to stop buying them! I think i have enough to get me thru for a while so hopefully I can curb my spending habit – we have a kitchen to pay for after all! Baby Movement? Feeling the drops, rolls and tickles on occasion. Mostly in the later morning while I’m sitting at the PC or later in the evening when i lay down to bed. Nothing really significant yet though. Best moment this week? Getting my Halloween shirt from Cafe Press! I have a little ghost face on my belly! Belly button in or out? Still a changing cavern..
Milestones? I have a significant bump in the morning when I wake up and it doesnt go away the whole way when i lay down! Sounds insignificant but it means that it’s more bump than plump now which makes me excited! I have lots of pics this week…. One looking down – taken at 16w 4 d or so…. One with my face in it – I actually had done my hair recently so I wasnt ashamed to show it! 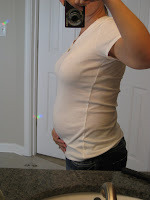 Again, 16w 4d. 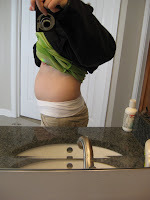 Regular belly shot – this am at 17 w even. Definitely more hanging out there than before! Goldfish crackers! I’ve felt two flops while eating these crackers! Hehe….definitley my child – we seem to share a love of cheeze! So, our kitchen is a mess! Not only have I not done dishes in a few days (ick…i’m lazy!) but we have construction material everywhere! It’s an obstacle course to get in there however, there has been progress! Once we have that done we can demo the old pantry (because now we’ll have the new pantry to put the food in), patch the wall, tile what we can without removing the cabinets and then finally removing the cabinets, finish tiling and hanging the new ones. How far along are you? 16 weeks! Total Weight gain/loss? +6lb based on todays dr appt but it depends on where you put my starting point. I think I’m +10lbs based on my lowest weight in the last 6 months! Maternity clothes? Yup! I’m still mixing bella band with maternity pants. I have one pair of jeans that didn’t need hemmed and all the others are at the taylors until tomorrow. Then I’ll have lots more! Baby Movement? Thought I felt a thump the other day but nothing since so I was probably imagining things. Best moment this week? I guess finally starting to round out and not look so much like I ate too many cheeseburgers! Food Cravings? Anything I see on the Food Network….i wanted maryland blue crab cakes last night…. Milestones? Dr’s appt today! We’re 4 months now! My ute it just an inch or two below my belly button according to the doc – wah! How far along are you? 15 weeks! Total Weight gain/loss? Would assume at least +5, we’ll know next week after the dr’s appt. Maternity clothes? Yup, at least part of the time. I managed to score some stuff at Kohls but need to get all the pants hemmed before I can wear them. The bella band is still my friend as well as a new pair of maternity capris! Baby Movement? None but I’m anxiously waiting…. Milestones? Nothing this week…just looking forward to movement! So I finally found some decent maternty clothes that didn’t cost me an arm and a leg! 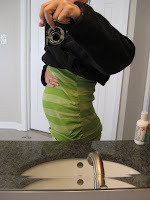 Kohls was having a 60% off doorbuster sale and thankfully they had a decent selection of maternity clothes – woohoo! I walked out of there with over $300 worth of clothes for just over $150! 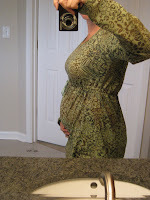 I bought two pair of maternity jeans (that need hemmed unfortuantley – damn shortness! ), two sweaters, a tank top, and a light long sleeved shirt for the fall. I also scored a few things at Burlington Coat Factory so, I think I’m set for now. I’ll need more long sleeved stuff as it gets chillier but for now I’m good to go. Plus I don’t want to buy too far ahead since I have no real idea of how big I’ll be at what points. Anyways, I’m a happy cookie today! And the icing on the cake is all the cabinets sitting in my garage asking to be assembled for our new kitchen! Nothing like a baking baby to get the ball rolling on a full kitchen gut job and reno! Backstory: So, we’ve been wanting to reno the kitchen since we bought this place. It has white laminate counter tops that are broken, warped and cracked in many places, old oak cabinets that have defintiely seen better days, three layers of flooring including a top layer of peel and stick tiles that have started to unstick in inconvienent places, and a wicked draft coming out of the cabinets that we’re only assuming is coming from a poorly insulated wall or hole somehwere behind the cabinets (not to mention a plumbing junction that according to the last plumber that was in here, is upside down and causing our clogging problems…). Anyways, it was the last on our list due to the complexity of it all. Now that there’s a baby baking, there’s a ticking time clock on getting this done. It has to be done before the baby is delivered. This gives DH (and whatever helpers we can pull off the street with the promise of beer) 7 months – think we can do it? You’d figure that with all my project management experience I’d have a project plan drawn up, with milestones, deliverables, and what not but no, I’m too tired after a full day of work to even think like that. I do have to put some sort of timeline together to keep us on track – otherwise it will be May and we’ll still have a torn up kitchen – yikes! Wish us luck! I’ll take pics as we make progress..
Two posts in one day! Wow, I must be on a roll haha! I thought it would be fun to see the difference a few weeks makes. Top pic is 14 weeks and the bottom is 6 weeks! What will really be fun is to take those same pics and compare them to 20, 30 and 40 weeks down the road. So, I’ve seen this little survey on other blogs and it was always fun to read so I figured I’d indulge you guys too! How far along are you? 14 weeks! Total Weight gain/loss? +5 based on my last appt. I think some of that is left over vacation weight from all the good starchy food in Germany! I’m avoiding the scale here at home so I can only guess what my pre pg weight was based on past history! Maternity clothes? Still rocking the Bella Band and a few maternity shirts. I ordered some stuff from Old Navy online but everything was too big so it’s going back. So, I’m holding out as long as I can with just my bella band and a few shirts. I was very disappointed in the maternity selection at my local mall. You basically had Motherhood and Old Navy. Motherhood is waaaaaay too expensive for my tastes so I’m stuck with Old Navy. Not even my Macy’s or JC Penny had a maternity section…boo! Stretch marks? None yet. I just spent $50 at The Body Shop for their coco butter stick but I’m hoping my genetics help me out here!! Best moment this week? Telling everyone – we finally let the cat out of the bag to everyone. Food Cravings? It changes day to day, one day was enchiladas, the next was pickles. I’m very influenced by what I see on TV. Time to stop watching the Food channel! Food Aversions? Nothing really – for once! 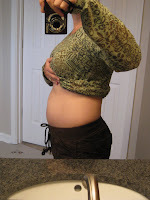 And for your viewing pleasure – 14week belly pics:) A little change from last week but not much. I took these mid day since that’s about the mid point. I’m much larger at night than when I wake in the morning.